It's a carsharing scheme like zipcar but the cars are all electric. How great is that?! 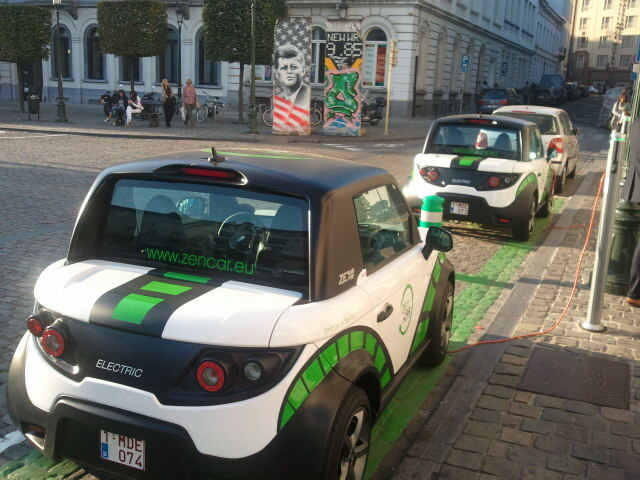 You can see that the cars are plugged in and charging in the photo*. Electric carsharing is coming soon to Paris through Autolib (see also THIS interesting article in the Economist about the man responsible). These are all a bit like the bike-sharing schemes like Capital Bikeshare (in DC), Vélib (in Paris), Boris bikes (in London - yes not the official site, but I like this better), and, happily, Mejor en Bici in Buenos Aires. It would be great if ways to encourage urbanites in polluted developing country cities to use electric cars as an alternative to petrol ones could be found. *As an aside, note the bits of Berlin Wall in the background on Place du Luxembourg. Nice picture! Electric car sharing sounds great, but be careful if you have an energy mix highly dominated by fossil fuels - like the US or Australia or Ireland - I would think twice before recommending going electric. Think about it, you are just moving the emissions from the city to the coal plant. So if what you care about is greenhouse gases you are better off walking, biking or using public transportation.